DETAILS: 90 Scrub Oak Circle is an impeccable home with Watercolor's Frog Pool only one block away. This gorgeous 4100 sq home has 5 Bedrooms and 5.5 baths including a beautifully decorated Carriage House. Enjoy the open concept living area connecting the dining room, living room, kitchen and incredible screened porch! The first guest bedroom is found on the ground floor. It includes a king bed and adjoining bathroom featuring a single vanity and shower. In addition, this floor includes a convenient office for those who may want to work remotely! As you venture upstairs to the second floor, you will find a second living space with comfortable seating and a TV. The luxurious Master Suite located on this floor offers a king sized bed and a spacious master bathroom with jetted soaker tub and large stand-alone shower. 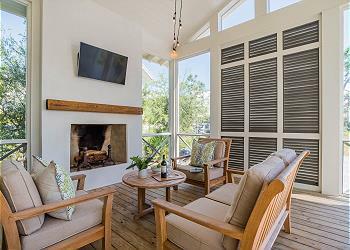 The furnished private balcony is the perfect way to start your day or star gaze at evening's end. At the end of the hallway you will find two guest bedrooms. The first with a king bed and private bathroom and the second with a full bed and connecting Jack And Jill. The bonus bunk room opens to the second floor living space and sleeps four with two sets of extra long twin bunk beds. The private Carriage House features a queen bedroom and bathroom with a single vanity and a shower-tub combo. It also includes an open concept living area connecting the fully equipped kitchen and living room with a queen sleeper sofa. You will find outstanding features and upgrades throughout the entire home including Viking appliances, beautiful wood floors, sealed marble countertops, solar shades and black out blinds. 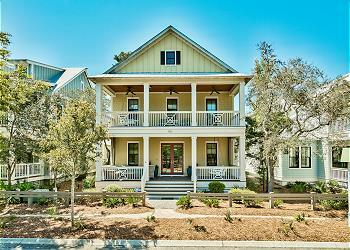 Enjoy beautiful 30A afternoons from a spacious front porch with plenty of seating to enjoy time with family and friends. Great family spring break! Camp Watercolor was thoroughly enjoyed by all of our young guests. Our home was terrific and we loved the location to all going on in the area. We will be back next year. Appreciated the location, so proximate to both Seaside and WC Beach. And the Frog Pool is literally a block away. Wonderful house, spacious and inviting! We are so delighted that you enjoyed 90 Scrub Oak for your vacation! We agree that this location is perfect for a care-free getaway! We look forward to hosting you all again very soon!